Substitute Jason Scotland grabbed the winner as Dundee United came from behind against the run of play to progress to the Scottish Cup final. Hibernian dominated the first half and took a deserved lead from the penalty spot after the break at Hampden Park. Derek Riordan fired home after Barry Robson hauled down Dean Shiels. But Jim McIntyre equalised from close range and Scotland fired the winner from 18 yards four minutes later as United belied their poor league form. United caretaker boss Gordon Chisholm had made one change, with former Hibs midfielder Grant Brebner replacing Mark Kerr in midfield. Steven Whittaker replaced suspended Hibs skipper Ian Murray, while Riordan was declared fit after being injured in last week's league defeat of United. Stephen Glass struck a 20-yard drive that stung goalkeeper Tony Bullock's hands in the opening moments to signal early Hibs dominance. Riordan was next to have a go, his clever curling effort from 25 yards looping a couple of feet over the bar. Whittaker was next to force Bullock into tipping the ball over the bar with a thundering effort from 25 yards. United battled their way back into the game but lacked composure and creativity, a curling effort by Stevie Crawford that flew well over being their only threat in the opening 45 minutes. 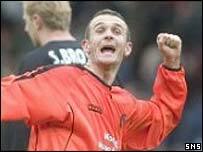 The Tannadice side had young defender Gary Kenneth to thank for a goal-line clearance after Riordan turned past Paul Ritchie and his low drive slipped under Bullock's body. Steven Fletcher skied over the bar from seven yards after Ritchie let a Riordan cross slip between his legs after the United defender's initial poor clearance. O'Connor sent a header straight at Bullock from eight yards as Hibs piled on the pressure. The match was more even as nerves began to tell after the break, but Hibs made the breakthrough after 58 minutes. Shiels was grappled to the ground by Barry Robson as the midfielder burst into the box and Riordan sent Bullock the wrong way from the penalty spot. Robson made amends by jinking into the penalty box and McIntyre forced home the winger's low ball into the six-yard area. Scotland had replaced Crawford just before the equaliser and put United ahead when he ran across the edge of the Hibs box and fired the ball low past goalkeeper Simon Brown's despairing dive. Dundee Utd: Bullock, Wilson, Kenneth, Archibald, Ritchie, Duff (Scotland 63), Brebner, McInnes (Kerr 66), Robson, McIntyre, Crawford (Samuel 69). Subs Not Used: Colgan, Grady. Goals: McIntyre 73, Scotland 76. Hibernian: Simon Brown, Whittaker, Caldwell, Smith, Murphy (Thomson 58), Fletcher, Scott Brown, Glass, Shiels (Sproule 67), O'Connor, Riordan (Morrow 78). Subs Not Used: Alistair Brown, Antonio Murray.